A 1972-era TV image of Mars' north polar cap. 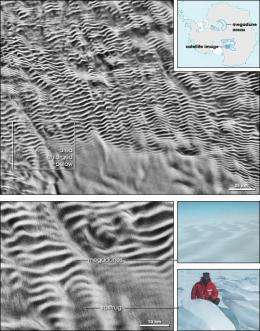 Icy megadunes in Antarctica do not spiral like the ice troughs of Mars. Undoubtedly global climate change. The Martians were putting too much CO2 into their atmosphere, and ... BOOM ... global catastrophe. You mean they drilled too the same as BP? Boom, Pow!? Crap. Ahhh... the billions of years does the trick again on earth [ gives an explanation that cannot be verified in any way ]. "Something changed. There must have been a very fast (relatively speaking) and powerful change in climate. We still don't know what that change was." So now we're either waiting for the predictable asteroid strike or some Mars shattering quake [ can't be an EARTHquake since it's on Mars?] to provide the way out. OK, I'm just being cynical here. It's good that they have put forward some theory to explain what formed those patterns - I just hope they stay honest. In order to STAY honest, wouldn't they have to start out honest? It's not rocket science guys. We're not going to see another quake. Period. The planet's core is just an unmoving lump. No plates, no quakes.